Does YOUR playground really have to be ADA compliant? The short answer is – YES. The Americans’ with Disabilities Act (ADA) is an all inclusive civil rights law that prohibits discrimination on the basis of disabilities. The ADA requires that newly constructed and altered … recreational facilities, including play areas, are among the facilities required to comply with the ADA. But making your play space accessible doesn’t have to be complicated or expensive. 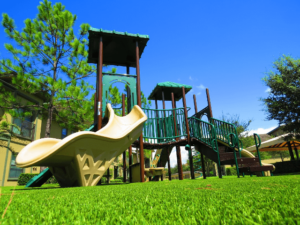 Adventure Playground Systems is here to help you navigate the intricate regulations and compliance issues that hinder commercial green spaces. Understanding that ADA compliance is all about making sure everyone is afforded the opportunity to play makes following the rules a lot easier. A play system or playground, at its essence is really a composite collection of play components. ADA guidelines ensure that those components and the type of entertainment they offer are spread out in a way that allows all children to play regardless of mobility and aptitude. The largest difficulty associated with ADA regulations and playgrounds comes in understanding component types, designations and accessibility pathways. Accessible routes or pathways are simply the path in which a disabled person can move around your site unencumbered. This pathway links ground level components and composite structures with ADA transfer stations to entrances and facilities also located on your site. They have strict codes to insure wheelchair accessibility and ease of movement. A 60 inch width enables two wheelchairs may pass each other or change direction when desired. A 1:16 max slope ensures easy movement along the pathway. An elevated play component is a play component that is approached above or below grade. Play components that are attached to a composite play structure and that can be approached from a platform or deck area are considered elevated play components as well. Consider a traditional slide. To enter the actual slide you must first climb either onto a system or up a ladder on a stand alone piece. This is a perfect example of an elevated play component. Ground-level play components are items that can be approached and exited at ground level. For example, a child approaches a spring rider at ground level via the accessible route. The child may ride then exit directly back onto the accessible route. The activity is considered ground level because the child approaches and exits it from the ground-level route. 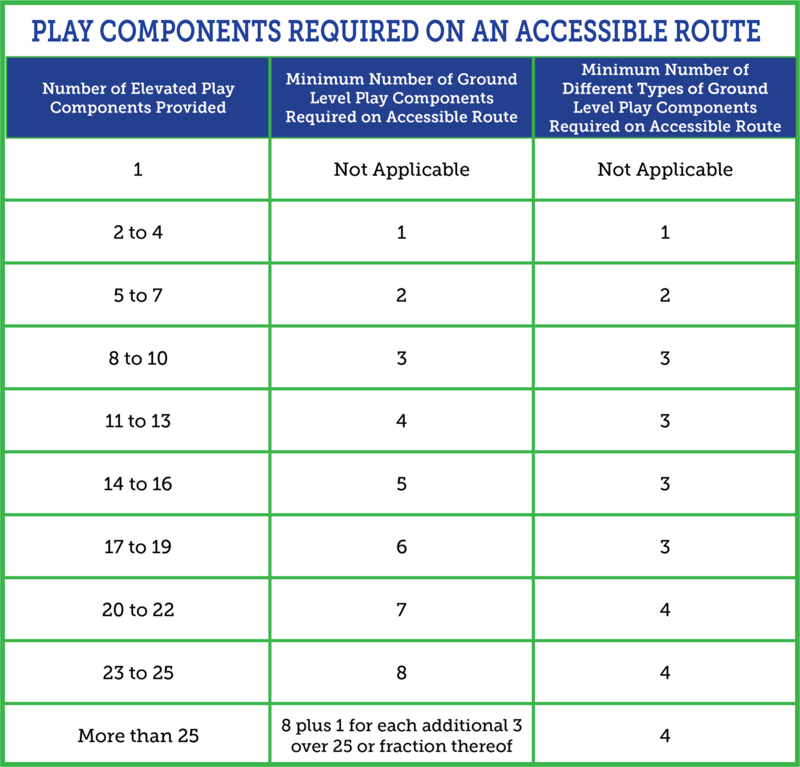 Ground-level play components required to be on an accessible route is determined by the number of elevated components provided in the play area and the type of play offered. The intent of this requirement is to provide a variety of adventures for those who choose to remain with their mobility aids or choose not to transfer to elevated play components at all. A pivot point is below the child’s center of gravity and the movement involves the whole body. Rocking is ideal for developing a child’s core muscle groups, balance, and mobility. This type of play can also be a calm, reflective place on the playground for children with Autism or sensory disorders. Consider adding a Periwinkle or Spring Rider for this type of play. Rapid vertical descent. One of the most classic activities on any playground, sliding teaches visitors balance as it relates to speed and distance. Not only does this time-tested activity provide hours of enjoyment, it’s vital to long term development of the vestibular system. Check out Adventure Playground Systems’ unique slides. The opposite of rocking, swinging provides a pivot point above the rider’s center of gravity. Like rocking, swinging is ideal for developing a child’s core muscle groups, balance and mobility. Swings also help children develop coordination and motor planning, sensory integration and focus. Take a look at Adventure Playground Systems’ Samson two bay swing set for a streamlined take on this time-tested classic. These spots create meaningful places for socialization, observation, and reflection. A bench located under a slide or climber may look like a boring piece of equipment, but in reality, it’s providing a child with a play to rest while still being near the action. It’s a point to gather and be home base, it’s a quiet safe spot in which to observe from. Consider adding bubble panels, benches, or the climb and discover cave. Play components that stimulate imagination can add worlds of play value to every playground and transform your system into whatever adventure the child wants. Take a look at telescopes, storefront or bus driver panels, and steering wheels to add new worlds of pretending to your site. A rapid turning movement. Children line up to spin until it’s hard to walk. But while they may become dizzy they’re also building muscle tone, developing balance and learning to maintain their position against natural forces. Adventure Playground Systems offer a full line of spinning independent play options to choose from as well as systems with spinning elements as well. The act of keeping one’s center of gravity over a base. Balance beams, sports boards and Epicenters all develop a child’s concentration, body movement and balance. The act of using one’s arms and legs to move, generally vertically. Climbing obstacles offer a variable cornucopia of development. From working large and small muscle groups, to coordination and movement planning. Climbing even develops the connection between the right and left side of the brain. Consider adding 360 Horizontal Ladder Climber, Geo Climber or climbing wall to your site. Equipment that appeals to multiple senses, such as touch, sight and hearing. Unlike other play types, sensory play’s objection is to excite, teach and entertain through the exploration of a particular sense. Sensory play supports cognitive growth, language development, fine and gross motor skills, problem-solving skills, and social interaction in ways unlike any other play type. This type of play appeals, especially to young children between 2-5 years old and mobility, challenged children who may find other aspects of play to difficult or intimidating. For a more complete list of ADA accessibility codes, regulations and definitions click here to visit the U.S. Access Board’s website. 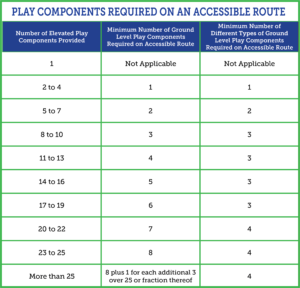 You can also download your own copy of A Summary of Accessibility Guidelines for Play Areas below. Our team of Adventure Play Experts have created a collection of helpful playground planning tools to download that can help guide you every step of the way. Here you can find informative resources on playground safety that will teach you about industry safety standards, compliance checklists and more!